In response to our main questionnaire (Questionnaire 2) the community were clear that they wanted a design guide to cover developments in the Roseland. 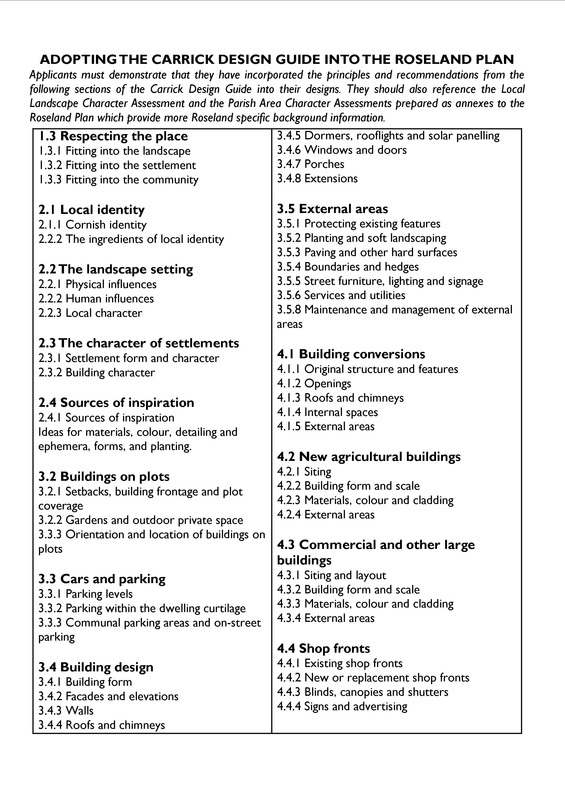 The Cornwall Design Guide is an excellent document for architects but is very process-oriented and is not considered detailed enough for our purposes. While it is our firm intention to produce a Roseland-specific Design Guide (as a Supplementary Planning Document), we have decided as an interim measure to adopt sections of the existing Carrick Design Guide. The beauty of this document is that it is illustrative of the detailed matters so important to the character and distinctiveness of the area.